To most Catholics in this country, St. John from Kenty—otherwise known as John Kanty or John Cantius—is an obscure saint, but even in Europe, probably few people know of Pope John Paul II’s deep and lifelong devotion to this professor saint. Only 13 miles from the Holy Father’s own birthplace, John was born in the small southern Polish town of Kenty on June 24, 1390. At the age of 23, he registered for studies at the Jagiellonian University, located in the not too distant city of Krakow—then, the capital of the Polish Kingdom. Founded 1364 by royal decree, it was the same university at which astronomer, Nicolas Copernicus, would study almost 80 years later. Enrolled in the Department of Liberal Arts, John became a doctor of philosophy in 1418. During the following three years, he undertook further studies in preparation for the priesthood, while supporting himself by conducting philosophy classes at the university. 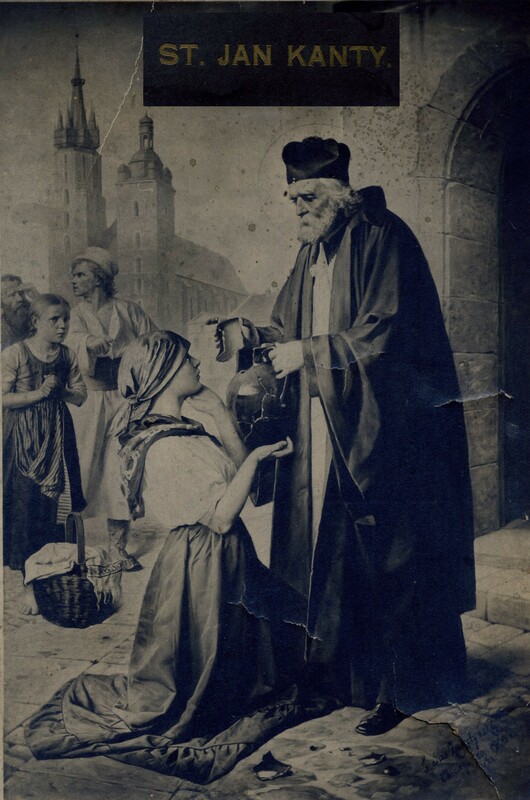 During the course of his life in Krakow, John became well known among the city’s residents for his generosity and compassion toward the poor, always sacrificing his own needs in order to help those less fortunate. He felt a special affinity toward needy students at the university, helping to care for their spiritual, physical, and academic needs. Whether it was in the classroom or in the pulpit, everyone knew him as a staunch defender of the faith and enemy of heretics.